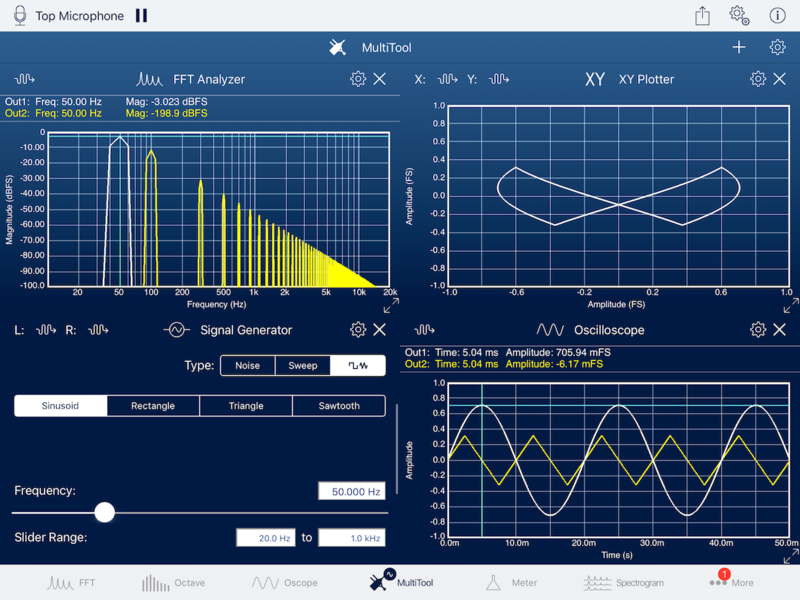 Faber Acoustical’s SignalScope X brings powerful new tools for dynamic signal analysis and data acquisition to iOS and replaces all the functionality currently found in SignalScope Pro, SignalSuite, IOScope, and RoomScope with subscription-based tool sets. For the first time ever in an iOS app from Faber Acoustical, SignalScope X may be downloaded for free. The user can then start a 7-day free trial of the Pro Tool Set Subscription. 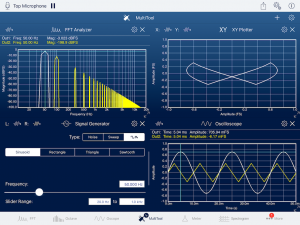 Without a subscription, the user is free to continue to use SignalScope X’s multi-channel Oscilloscope tool. SignalScope X is available for download on the App Store, now. The original SignalScope and SignalSuite for iPhone were available for download on the opening day of the iPhone App Store. 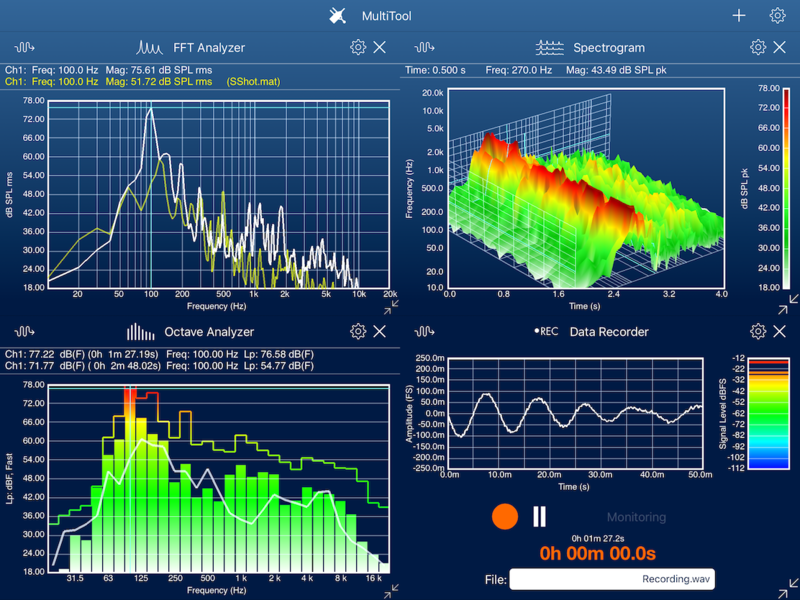 Now, after nearly 10 years of iOS development, SignalScope X offers a clearer expression of Faber’s vision for the future of acoustics-related signal analysis, data acquisition, and measurement on mobile devices. The most powerful addition to SignalScope X is the new MultiTool. SignalScope X’s MultiTool acts as a project manager and host for the other tools in SignalScope X. On iPhone, up to 2 other tools (subtools) may be added to the MultiTool at one time. iPad models support up to 4 subtools, except for iPad Pro models with 10.5-inch or larger displays, which support up to 6. Besides the obvious benefit of being able to see and interact with multiple subtools, simultaneously, the MultiTool can save its current subtool configuration under a user-defined name. Any of the saved configurations can then be selected for immediate application in the MultiTool. This allows for different configurations to be saved for different projects or jobs. For example, one configuration might include an Oscope and FFT Analyzer and another might include an Octave Analyzer and a Data Recorder. On iPad, one configuration might include all 4. Even when using just a single subtool, the MultiTool allows multiple configurations of that tool (e.g. a unique configuration of the Dual FFT Analyzer for each of several different measurement types) to be saved and recalled at will. SignalScope X’s new Data Recorder tool supports real-time continuous streaming of up to 8 channels to an audio file. Along with the audio file, SignalScope X can save an “info” file, which contains metadata including date, time, location (if enabled), input channel details, and sensitivity calibration information. This metadata will also be embedded within the audio file, itself. The new real-time XY Plotter allows the user to immediately visualize time, frequency, and amplitude relationships between two signals, or even create visually appealing images such as Lissajous curves. Other significant features new to SignalScope X include optional background operation, independent/simultaneous operation of all tools, and independent input/output channel selection in each tool. It is also now possible to directly analyze the output of the signal generator in any of the real-time analysis tools. SignalScope X also makes it much easier to move data files in and out of the app via Files (iCloud Drive), Dropbox, or other apps on a user’s device that can load or export compatible files. SignalScope X offers in-app subscriptions for Basic, Advanced, and Pro tool sets that can automatically renew at monthly or annual intervals. Subscriptions give users access to updates, new features, and new tools within the subscribed tool set. Subscriptions also cover ongoing hardware support, such as periodically updated nominal microphone sensitivities for built-in microphones on Apple devices, updated nominal voltage sensitivities for select audio input devices, and automatic calibration for audio input devices that include built-in sensitivity information. The Basic Tool Set includes the Oscope, FFT Analyzer, 2D Real-time Spectrogram, and XY Plotter tools. 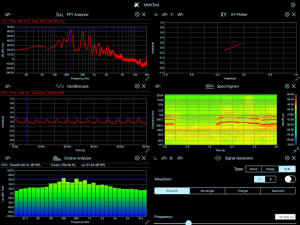 The Advanced Tool Set includes the basic tools as well as the 3D Real-time Spectrogram, Octave Analyzer, Level Meter, Data Recorder, and Stereo Signal Generator tools. The Pro Tool Set includes the basic and advanced tools, plus the Dual-channel System Analyzer (Dual FFT), Room Acoustics Analyzer, and MultiTool. 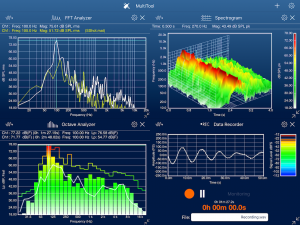 The existing SignalScope, SignalScope Pro, SignalSuite, IOScope, and RoomScope apps will receive maintenance updates and remain available for sale on the App Store for a limited time for the benefit of those who need access to their respective tools on iOS 8 and 9. SignalScope X requires iOS 10 or 11 and is designed to take full advantage of the iPhone X’s 5.8” screen.